Exclusive: Tom Hiddleston Talks the Future of Loki and King Kong! Tom Hiddleston talks Loki in the Marvel movies and King Kong: Skull Island! As anyone who has seen his Comic-Con appearances knows, actor Tom Hiddleston clearly relishes playing the trickster god Loki in the Marvel Cinematic Universe. When we last saw him in Thor: The Dark World, it looked like Loki had finally wormed his way onto the throne of Asgard, but how will that impact his portrayal of the character in trilogy-capper Thor: Ragnarok and beyond? We chatted with Hiddleston at the junket for his new horror film Crimson Peak, and although he seemed confident on how he will continue the role, it sounds like there might be some question of whether he will return at all. Would fans want a Thor movie without Loki? Hiddleston also spoke about his lead role in Warner Bros. and Legendary’s upcoming Kong: Skull Island and confirms we’ll be getting an answer to one of the biggest King Kong mysteries! ComingSoon.net: So in the earliest Jack Kirby issues of the comics, Loki was just blatantly evil, but in the movies you’ve given him a great deal of sympathy where he’s clearly trying to please his parents. Now his mother’s dead, he’s usurped Odin, so do you plan to keep him a multi-layered/sympathetic character or is he going to go full-blown supervillain? Tom Hiddleston: You know, I don’t know. I think I won’t be able to help it if I ever play him again, and I just don’t know when that’s gonna happen, if that’s gonna happen. I would never lose his dimension, but it’s so interesting. I’ve talked with Chris Hemsworth, how those characters have changed as we’ve changed. It’s five years ago since I played him for the first time. That’s a long time ago. So who knows what I’ll be cooking up! CS: I’m sure you’ll have some tricks up your sleeves. CS: You’re also doing “Kong: Skull Island” for Legendary. Are you guys gonna answer a question I’ve had my whole life: Why would the islanders build this giant wall to keep King Kong in, but build a GIANT, KING KONG-SIZED DOOR for him to get out of? Hiddleston: (laughs) There will be an answer to that question, yeah. Yes. Jordan Vogt-Roberts has a really interesting take on the whole thing, and it’s really new and original. It doffs its cap to the mythology but also takes it into a new place which I hope you will find exciting. Marvel’s Thor: Ragnarok is currently scheduled for release November 3, 2017, while Kong: Skull Island will open its door on March 10, 2017. 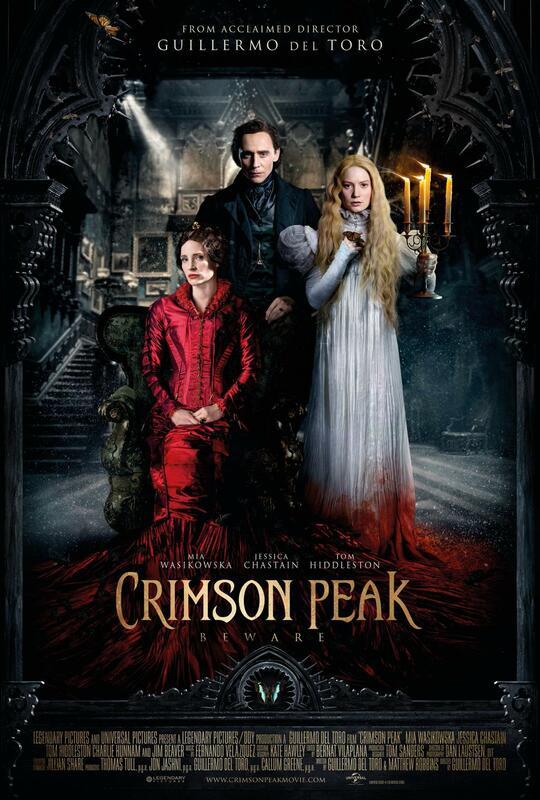 Crimson Peak hits 2D theaters and IMAX on October 16.